Moving on from 2d and 3d shapes Canberra Class are now taking on the challenge of learning all about circles and their properties and are going to be introduced on how to draw a circle using a compass. All about circles and how to draw them using a compass. In Canberra class we are learning all about shapes and their properties. We will be following instructions and applying our knowledge of the shapes properties to be able to draw them. After looking at 2d shapes and their properties we will then move onto 3d shapes and their nets looking at how they are formed and the shapes used to make up each 3d shape. Fractions, percentages and decimals are our focus in Maths. The children have been learning how to find a percentage of a number or an amount. A new term and lots of new maths to learn. 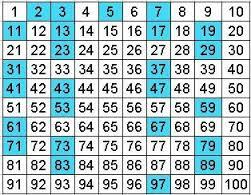 We have started by looking at prime numbers and how we can help to identify them in a hundreds square by using our times tables knowledge. This led us to looking at common factors of numbers and using factor bugs to help us find them. In maths Canberra class have been taking on the challenge of short column multiplication and bus stop method division. They have all shown great resilience in learning these new skills and putting these skills into practice. Fractions have been our learning objective over the past few weeks in maths. learning how to add, subtract, multiply and divide a fraction and how to convert an improper fraction to a mixed fraction.